Weekday breakfasts are pretty standard around here -- granola with nut milk in the summer, and some variation of oatmeal in the winter. Sometimes though, on those extra wintery mornings, I need a little extra motivation to get out of bed. That's how these pancakes came to be -- a happy accident one early weekday morning. 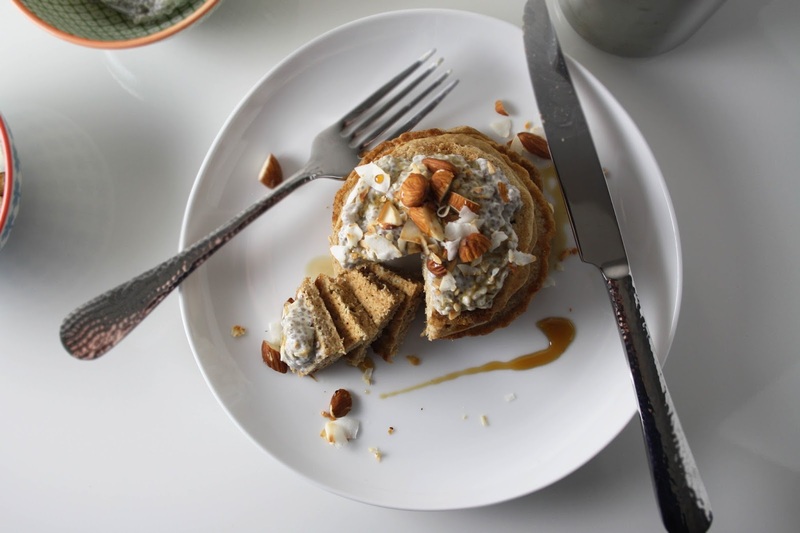 I'd seen chia puddings all over the web, but knew, knowing my tastes, that I wouldn't like it on its own in a bowl or parfait -- it needed to be more of a topping, like yogurt or compote are to waffles. I've been on a kick supreming citrus lately, and decided to whisk some fresh grapefruit juice and maple syrup into the chia mixture. The result was perfectly balanced in flavour, with subtle hits of sweetness from the maple, and tartness from the grapefruit. 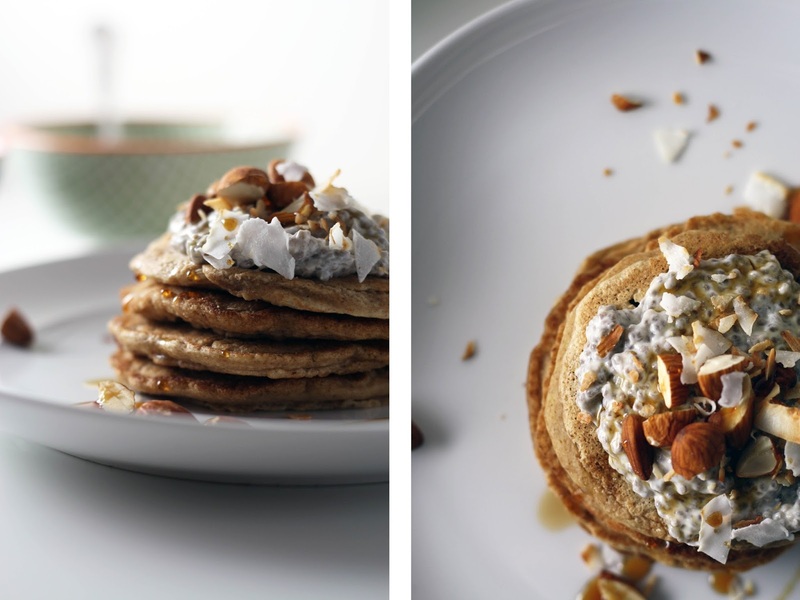 The pancakes are easy, and come together quickly -- and like I said, totally achievable on a weekday! 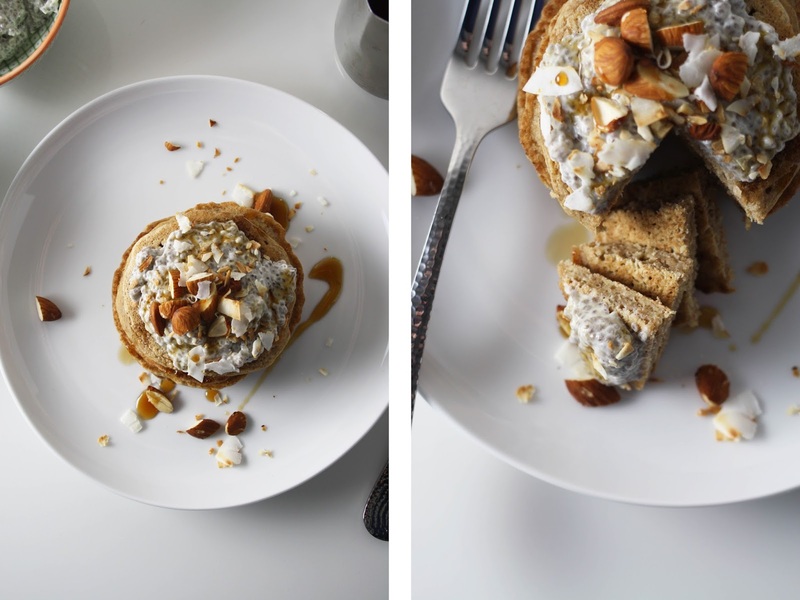 Whether you're treating yourself to a next-level weekday breakfast, or whipping up a batch of these pancakes on a quiet weekend morning, be sure to start the chia pudding the night before - it needs to hang out in the fridge overnight. A note about the quantity of milk -- less liquid means a thicker batter, giving you a denser taller pancake. I've made these with both 1 1/4 cups of milk, and 1 1/2 cups of milk. Each yielded a different, but equally delicious pancake. The night before, whisk together the yogurt (or milk), grapefruit juice and maple syrup until smooth. Stir in the chia seeds. Cover with plastic wrap and set in the fridge until morning. In a medium size bowl, whisk together the dry ingredients -- flour, sugar, baking soda and baking powder. Once free of any lumps, add the milk and olive oil, stir to combine until no dry flour remains. Heat a skillet over medium heat. Once hot, add a nub of butter or coconut oil. Use a kitchen brush to spread the butter evenly through the skillet. Cook the pancakes in batches, pouring or scooping 1/4 cup of batter per pancake. Allow to cook until the edges are set and the batter begins to bubble. Flip and continue to cook for 2-3 more minutes. Keep pancakes on a wire rack until ready to eat (or in a 200 degree oven). 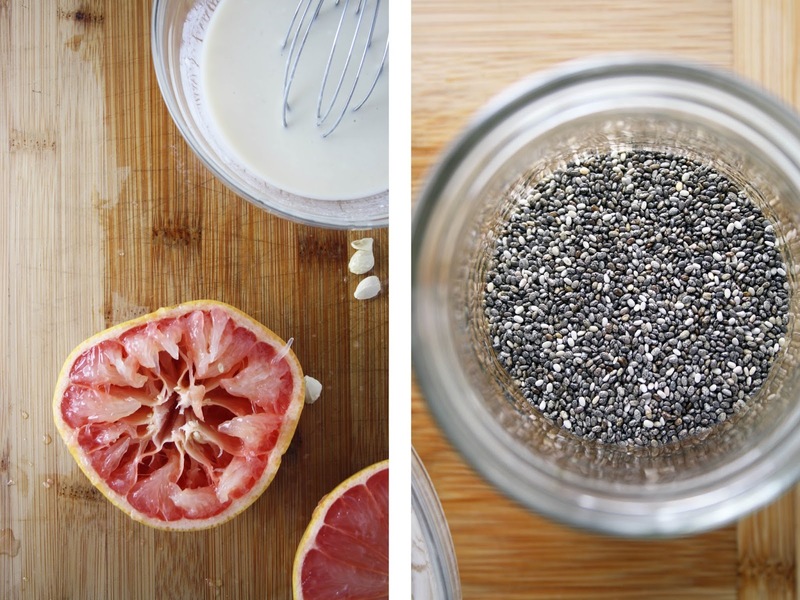 Remove the chia pudding from the fridge and give it a good stir. 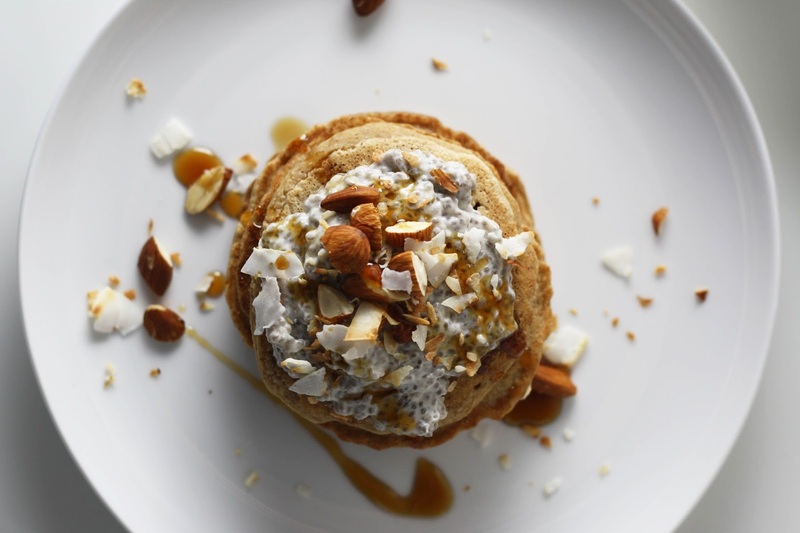 Stack 3-4 pancakes on a plate and top with a dollop of chia pudding, a sprinkling of almonds and coconut and a drizzle of maple syrup. Enjoy!